Another question that surfaced when the prospect of video sharing began was whether it would represent a way for people to see the news for themselves, without the filter of journalistic editing. The answer appears to be yes, but there is equally a place in this platform for edited journalistic story telling. Users of this platform, in other words, view both styles of videos, depending on the news event. In all, more than half (58%) of the most-viewed videos were those that were edited in some way before they were uploaded to YouTube. This means those videos consisted of different shots assembled together to provide meaning or context. Some included narration while others did not. 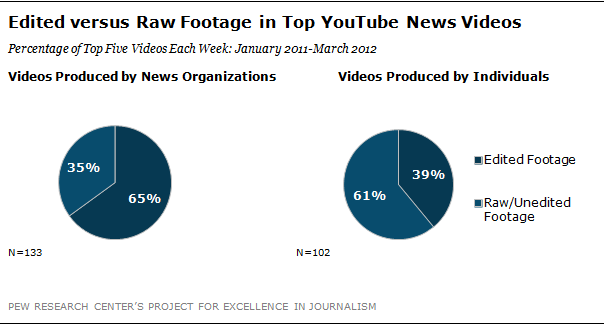 News organizations were much more likely to include edited news stories than raw footage without narration, but pure footage was part of their tool set. Of the 133 videos produced by news organizations, 65% were edited while 35% were unedited. The format of videos from various organizations also differed, depending on the content. Of the 22 videos produced by Russia Today 15 were composed entirely of unedited footage. All nine of the videos produced by Fox News came off of their broadcasts and were edited in some way, as were all eight of the videos from the BBC and the four from ABC News. Citizens, on the other hand, were more likely to shoot and share raw footage, but this, too, was not the only way that they delivered news to YouTube. The majority (61%) of the most popular videos produced by individual users (of which there were a total of 102) were made up of raw, unedited footage, and a little more than a third (39%) were edited. In short, we see a merging of styles on YouTube, in which news organizations lean toward traditional storytelling but, led by organizations such as Russia Today, incorporate citizen documentary in its raw form as part of their news content. Citizens, meanwhile, lean toward being documentary eyewitnesses, but in sizable numbers are turning to journalistic storytelling that involves the tools of editing and narration. And consumers seem comfortable moving from one style of video to the next-viewing based on the news event rather than on the entity providing the video or the format used to produce it.